Meet the Latest Machines from MJ Engineering! 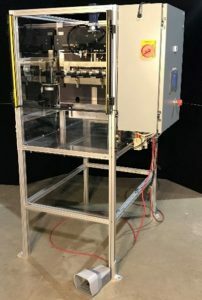 MJ Engineering recently completed two custom-designed machines for clients in the medical and automotive industries that save time, improve quality and accuracy, and reduce waste. The syringe filling machine (right) can simultaneously fill four oral syringes (up to 20mL) with liquid medicines of varying viscosities at a pace more than double that of the client’s best operator. The machine eliminates air bubbles and has programmable fill levels, leading to accurate measurements of medicine every time. The oral syringe filler uses safety light curtains, and it has a foot pedal for handsfree operation, as well as stainless steel and aluminum parts for easy cleaning. MJ Engineering’s battery bar verification machine inspects vehicle battery bars and rejects the ones that do not meet the part’s height, form, or thread criterion. The three-part process uses a combination of technologies: a height gage, a backlit conveyor belt that moves the part past two high-resolution Cognex cameras, and a New Vista thread verification system. With this machine, the client can inspect 100% of the battery bars more quickly, accurately, and objectively than a human operator. An abundance of exciting new products and technologies were on display at three well-attended manufacturing and automation shows held in the Midwest last fall. At the Advanced Manufacturing & Technology Show, in Dayton, Ohio, Fortech, LLC, demonstrated new software that enables users to monitor equipment downtime. The system uses different input methods, including PLC error messages, other downtime reporting systems, and a unique video stream analyzing option (see the next article for more details). At the Assembly Show in Chicago, Schunk displayed a multitude of pneumatic and electric grippers. Some of the newer grippers have a specialized design to enable them to integrate with today’s collaborative robots, including ones made by Fanuc, Kuka, and Universal. The Fabtech show, also in Chicago, was by far the largest, with hundreds of companies offering equipment for cutting, bending, welding, and anything related to metal fabrication. 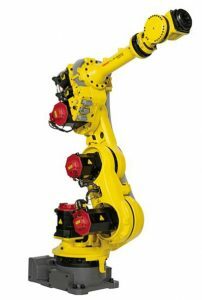 Fanuc showed off its new seven-axis robot, which is designed to enable the robot to fit into tight and awkward spaces. The seventh axis is located between what would be the second and third axis on a traditional five-axis robot. To learn about other new offerings in the automation and manufacturing world, and to get to know our current and potential customers’ products, it is well worth your time to attend these types of events. 1. The software pulls information from the system’s PLC or an existing downtime tracking software. The MES system then displays this information on a graphical interface for viewing in real time. The A1Webcams camera system can be added to further track system performance, because it is integrated with a graphic display that can play video from any recorded event. The conditions displayed are: normal running, blocked, starved, and failure. When using the software, specific events can be selected, which will automatically pull the video from a DVR recording. 2. Data can be collected via live video stream. The system analyzes the live stream for abnormal movement. Initially, the normal movement is programmed, so the system will recognize any abnormal condition, including starved or blocked conveyors or dropped parts. It can even help with tracking employee safety. To learn more about this system, please reach out to sales@mjengineering.com.